Pope Francis and President Erdogan have vastly different views of what constitutes moderation and tolerance. Last week, Pope Francis paid a visit to Turkey in what was seen as an attempt to align the Catholic church with moderate Muslims. In a gesture of goodwill, Pope Francis visited the Blue Mosque, one of the masterpieces of Ottoman architecture, where he turned east toward Mecca, clasped his hands and paused for two minutes as the Grand Mufti of Istanbul delivered an Islamic prayer. 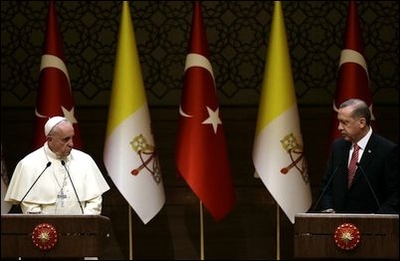 Earlier on Friday, the pontiff met with President Recep Tayyip Erdogan. In an address following the meeting, the Pope condemned the Islamic State's (ISIS) assault on Christians and other religious minorities in Iraq and Syria. He would later say ISIS was committing a "grave sin against God." To ensure his condemnation of ISIS was not misinterpreted, Pope Francis also denounced people "who say that all Muslims are terrorists." If the pontiff thought Turkey's leader was the moderate Muslim who would reciprocate in kind, he was setting himself up for disappointment. On the same day the pontiff met president Erdogan, the Turkish leader delivered a blistering attack on the West, claiming, "They (the West) look like friends, but they want us dead — they like seeing our children die. How long will we stand that fact?" The Turkish newspaper Hurriyet reported Erdogan as saying: "Believe me, they don't like us." In an incendiary attack on his NATO partners, Erdogan said they "love oil, gold, diamonds, and the cheap labor force of the Islamic world." The Pope could have taken a less appeasing attitude by standing up to the supremacist and arrogant attitude of global Islamism that poses a threat to human civilization in many ways. At the state level, countries like Turkey and Qatar are behind the phenomenon of the Islamic State. Elsewhere, Saudi billionaires and institutions fund mosques and Islamist organizations in Canada and the U.S., while in countries like Pakistan, Islamist mobs recently threw a young Christian couple into a brick kiln after breaking their bones, on charges of committing blasphemy. Appeasement of the Islamists only strengthens them and weakens the Muslims fighting jihadists on the military and ideological battlefields. The pope could have been firmer. He should have raised the issue of Hagia Sofia in Istanbul, which for almost 1,000 years was Orthodox Christianity's Kaaba so to speak, but which was forcibly converted into a mosque by Muslim invaders in 1453 Ottoman conquest, and later was turned into a museum in 1935. If Islamists and leaders of Islamic countries truly wished to reciprocate to the pope's gestures with an olive branch, what better way than to hand the Hagia Sophia back to Orthodox Christianity. Perhaps Erdogan's harsh response to the pope's gesture will make the West realize that Turkey is not an ally, but our enemy. Whether its the RCMP reaching out to Islamists in Canada or the Pope extending a hand of friendship to Erdogan, the outcome is written on the wall. Tarek Fatah is a founder of the Muslim Canadian Congress, a columnist at the Toronto Sun, host of a Sunday afternoon talk show on Toronto's NewsTalk1010 AM Radio, and a Robert J. and Abby B. Levine Fellow at the Middle East Forum. He is the author of two award-winning books: Chasing a Mirage: The Tragic Illusion of an Islamic State and The Jew is Not My Enemy: Unveiling the Myths that Fuel Muslim Anti-Semitism.